The 4 Gate Workgate Barriers are strong, robust system, and are designed with the contractor in mind. The 4 Gate variant, each side having a chapter 8 reflective top panel, linked together with black clip-on hinges. Each panels is 1m x 750mm. These JSP 4 Gate Workgate Manhole Barriers fold easy for quick deployment and lightweight for storage and handling. 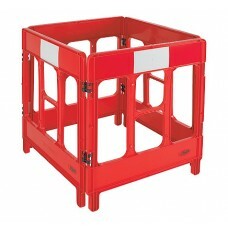 These JSP 4 Gate Workgate Manhole Barriers are supplied in red.